This year, merz + benteli the Swiss adhesive and sealant specialist for reactive systems is celebrating its 100th anniversary. As an independent company, merz + benteli develops, produces and markets cutting-edge elastic sealants and adhesives. In 1918 Walter Merz and Albert Benteli founded the company, while still studying chemistry; their intention was to produce high-quality adhesives and luminescent materials used in the watch industry. For many decades, the fully synthetic and waterproof adhesive Cementit was part of everyday life in most Swiss households. Today, merz + benteli develop, produce and market cutting-edge SMP adhesives and sealants. More than 100 employees work for merz + benteli at its site in Niederwangen near Bern including 16 employees in the Research and Development Department. As a niche player in a globally competitive B2B market, the family-owned company focuses on providing solutions that meet demanding customer requirements. Working in collaboration with selected market partners in Europe, the Middle East, The US and the Pacific, the company are able to provide adhesive and sealants globally, generating annual sales of around 50 million Swiss francs. With the brands Gomastit for construction applications, Merbenit for industrial applications, and Merbenature made from over 50% renewable raw materials, merz + benteli ag positions itself as a stand-alone and independent specialist for innovative market services in the areas of sealing, gluing and protecting. Studies predict that the sealing and bonding industry has a promising future, because bonding has advantages over conventional, mechanical joining techniques – especially when using weight-reducing plastics and composites. “There are many reasons for merz + benteli’s success. One is ‘Swissness’: Exclusive development and production in Switzerland guarantees consistent product characteristics, constant innovation and strict adherence to environmental standards. We want to write another 100 years of successful Swiss economic history with sealing and gluing,” says Dr. Georges Bindschedler, Delegate of the Advisory Board. To commemorate the occasion, Johann Schneider-Amman, the Swiss Minister of Economic Affairs, Education and Research along with other VIP guests had visited the headquarters of merz + benteli AG. The company have published a book entitled Merz & Benteli – History with Lights, Glue and Dense and activities are scheduled throughout the year. 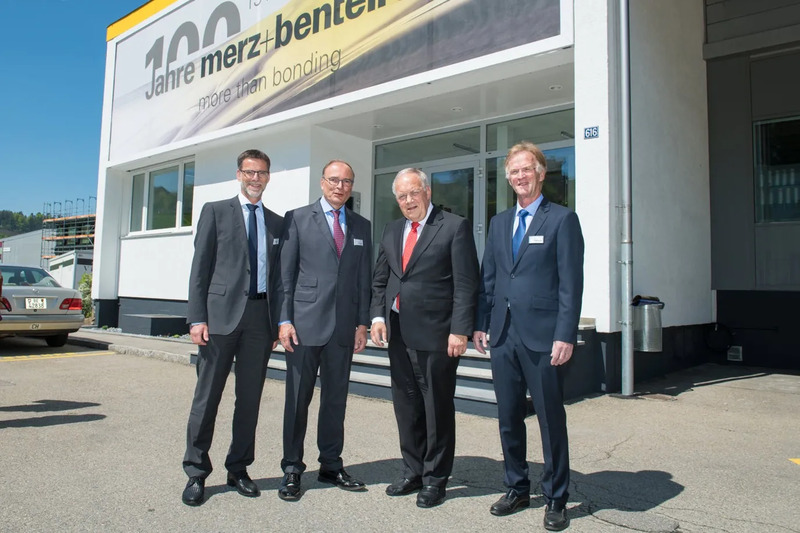 VIP Guests visit Merz+Benteli AG – Dr. Claude Lerf (CEO + Technical Director), Dr Georges Bindschedler (Board of Directors), Federal Councilor Johann Schneider-Ammann and Roland Schmid (President of the Board of Directors).